Acme's Citrus and Almond "Brioche"
Acme has established itself as one of the Bay area's favourite bakeries. At their new home in food paradise, The Ferry Building, there is always the longest queue of people snaking through the main thoroughfare, every one anxious to get their hands on some of Acme's respected baked goods. This location is the only one, other than the Berkeley original, that sells their entire range of baked goods. I waited in the line on Saturday to buy croissants. Their version of the classic French pastry is deliciously crunchy with a soft inside. Acme's croissant is one of the few in the area that Fred has good things to say about. 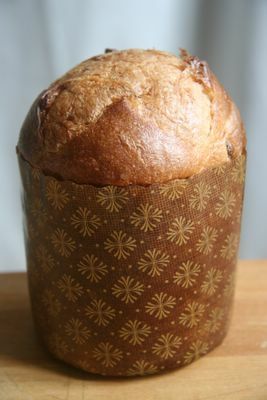 When it was my turn to shop, a little brioche caught my eye. In general, I am not a big fan of brioche, but the words "Citrus and Almond" stopped me in my tracks. I was sold. As I recall it cost $3.25. There was a larger version available too. I chose to eat it for breakfast, sliced and toasted with pats of cold, creamy butter. The candied orange and lemon peel infused a pleasantly marmalade-like flavour to counteract the sweetness of this light, eggy, cakey, sweet bread. The almonds imparted a crunchy texture. It was a delicious change from more traditional bread. The flavours reminded me of Easter. I must remember to pick up another one in time to celebrate.